The following steps walk you through setting up an integration with Edval Web.Daily. You will need an administrator level access to use these features. After enabling integration, anything that you sync from Edval Web.Daily will overwrite the corresponding data held within MyEDiary. This includes Class Lists, Teachers, Students, Class Memberships and Class Occurrences. After integration has been enabled you will only be able to manage this data within Edval Web.Daily. Any data that exists within MyEDiary that does not exist in Edval will be deleted from MyEDiary. This step is currently performed by MyEDiary Support. 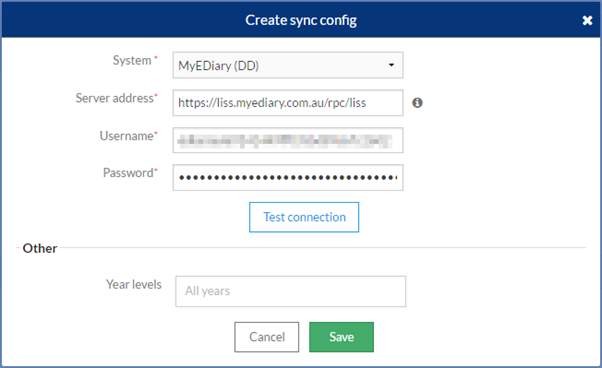 Please email support@myediary.com.au in order to obtain your Edval Integration Settings. Upon receipt of the settings, please continue to Step 2. Within Web.Daily go to Daily > Admin > Synchronise. On the “Sync configs” page click “Add sync system”. Select System “MyEDiary” and insert the Server address, Username and Password you were presented by MyEDiary Support from Step 1. Under the “Other” section, you might want to modify “Year Levels”. If you want to send all year-levels to MyEDiary then no need to modify anything here. To select which data you would like to publish to MyEDiary, from within Edval Web.Daily go again into Daily > Admin > Synchronise. 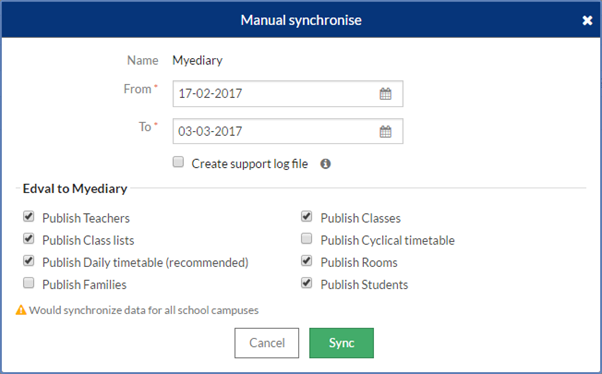 Select the “MyEDiary” configuration, then click “Manual sync”. Here you can choose what data you'd like to publish to MyEDiary every time you choose to sync from within Edval Web.Daily. Note: MyEDiary only accepts certain 'publishes'. See here for an up-to-date list on what data we can accept. Leave the default values for 'From' and 'To' dates and click 'Sync'. 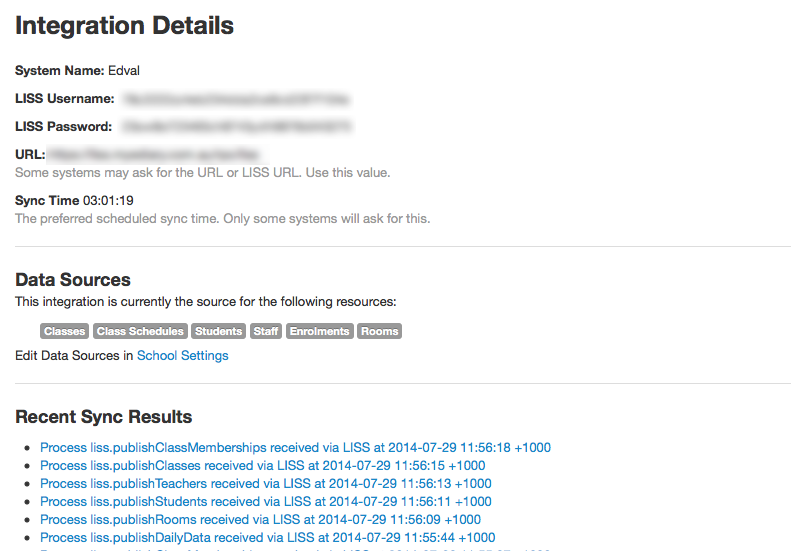 Now everything is configured, you can run your first sync from within Edval Web.Daily. Go back to Daily > Admin > Synchronise. Select “MyEDiary” configuration and click 'Auto sync'. Leave the default value for dates, and click the 'Sync' button. This will initiate a sync with the MyEDiary servers. 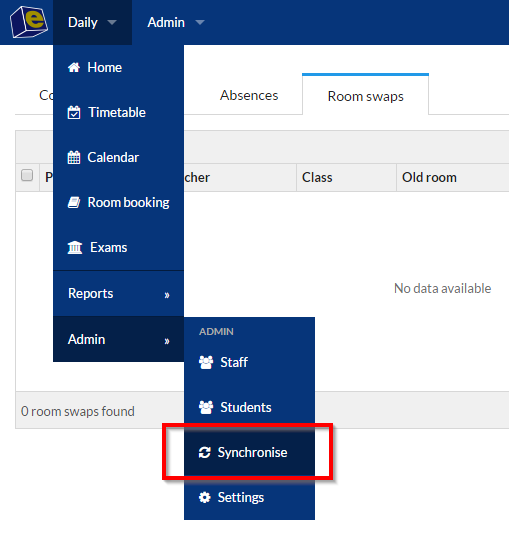 Verify that MyEDiary has received the sync request by refreshing the Integration Details page for the Edval integration that you setup within MyEDiary. After several seconds you should see the queued requests from the sync start to display in the list of Recent Sync Results. Each result can be clicked to reveal the sync log. Note: Keep in mind that the syncs are queued and processed in the background, It typically takes 3 - 15 minutes for a single sync request to process, depending on how much data has been published. Read more about the sync logs here. Note: If you find that first and last names are being reversed, check that Edval has the names in the format 'SURNAME, First Name'. If the comma is present Edval recognises that the first name is actually the surname, otherwise without the comma it assumes the first name is the first name. You can now make use of (or spend as you see fit!) the time you have saved not manually entering or importing data into MyEDiary.